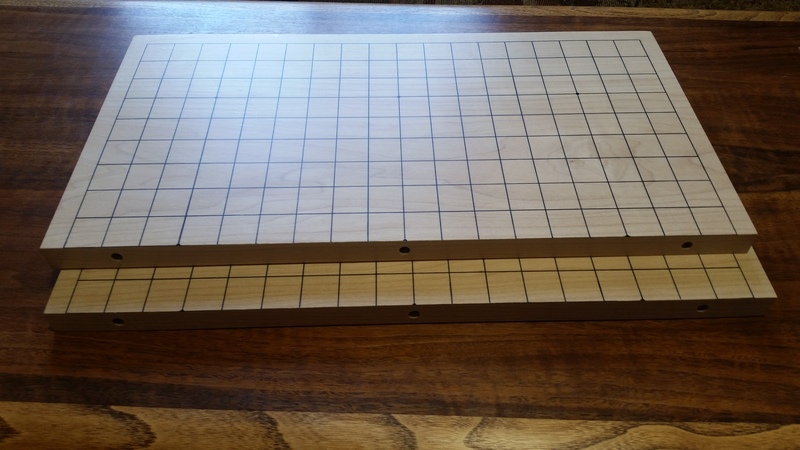 Here is how I made my portable 19x19 goban after not being able to find a solid wood board without hinges for sale. This is a list of things used, besides all the tools for planing (if necessary), cutting, and drilling the boards. The wood I decided to use. The white maple board ended up about 19 mm thick. The board dimensions for each of the two pieces were 227.3 mm x 424.0 mm for an overall board size of 454.6 mm x 424 mm. There is a 14 mm boarder and the line spacing is 23.7 mm and 22 mm for the shorter side. The dowels used to hold the two halves together are 1/4 inch, these are just held by pressure and are removable by hand. 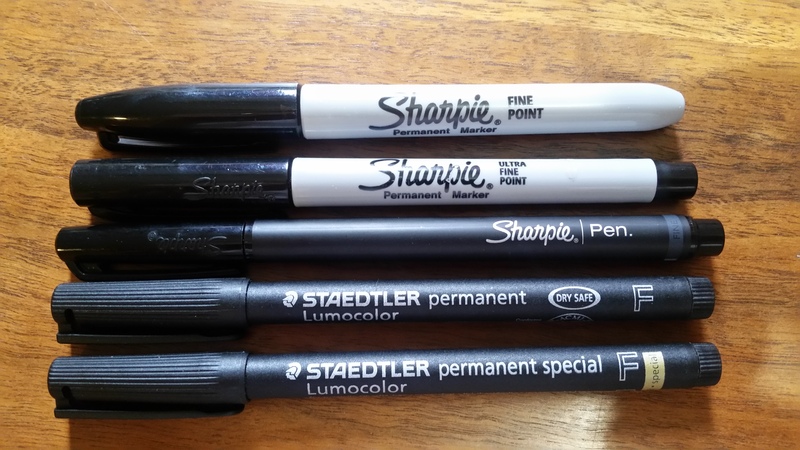 I did some test runs of a standard Sharpie (fine point), Sharpie (ultra fine point), Sharpie pen, Staedtler Lumocolor F, Staedtler Lumocolor Special F. I would not use the Sharpie pen and the ultrafine point, other than that is sort of seems personal preference. I liked the look of the Staedtler Lumocolor Special F best and used that. For making star points that are about 4 times larger than the line thickness. I highly recommend this exact finish. It is a Urethane/Acrylic blend. Whatever you use, make sure it is water based to avoid potential bleeding problems with oil based finishes. 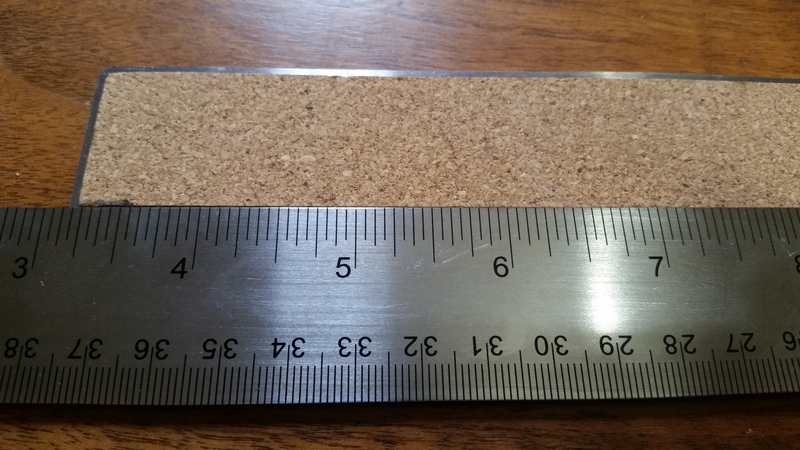 A 18 inch steel ruler with cork backing. This is somewhat important to prevent ink bleeding. See the image below for details. The first steps are planing, cutting the boards, drilling holes for dowels, and then sanding until level, starting with about 80 grit and working up to about 220 grit. Next, a moderate layer of the water based finish is applied and allowed to dry for a day or two. Some water was added to the finish to thin it out a bit, since the goal of the first coat is to fill the wood grain and block it from causing the ink to bleed. A very light sanding just to smooth the finish for drawing lines using 320 grit sandpaper. The grid line locations were marked with pencil, about 1 cm marks near the outside border of all sides. The outside box was drawn. Extensive use of painters tape was used to cover where the end of the lines are. It also provided the benefit of testing where the ruler and pen would make a line. The nice part about having the coat of polyurethane applied is that mistakes can be 'erased' use a razor knife or hobby knife. The inside grid was drawn and let sit for a day. Two more light coats of polyurethane were applied and let dry for a day or two. I plan on making another soon with the leftover wood. Last edited by MagRes on Fri Jan 25, 2019 10:00 am, edited 1 time in total. Wow gorgeous work. I envy your craftsmanship. Question - I understand maple is a very hard wood, and wonder about the sound and feel as stones are placed on the board. Katsura, by contrast, is so soft that it not only mutes the sound, but creates dents when the stones slapped down on it over time. 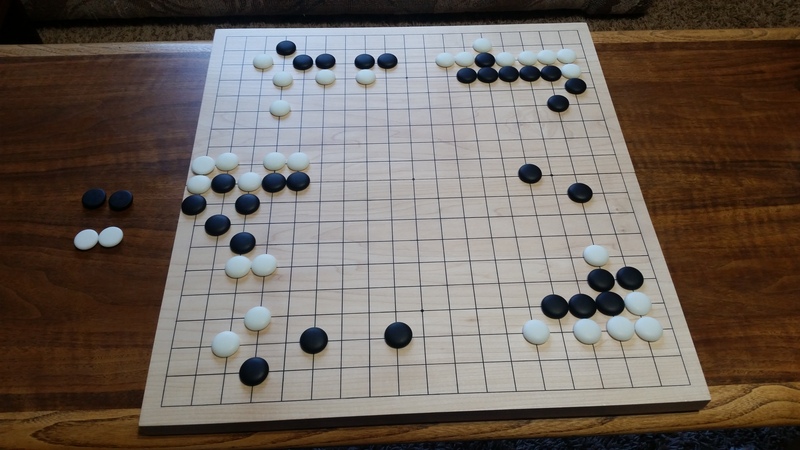 Most of the traditional go board woods are somewhat soft, e.g. katsura, kaya, hiba, hinoki, spruce, agathis. I suspect that somewhat soft wood is desirable because it cushions the fingers when the stones are "slapped" down. I've heard that clam shell stones can break if played energetically on a hard wood. I've never noticed it myself, but my own boards are made from katsura, kaya, and hiba. Very nice craftspersonship! I guess it would be hard to find quarter-sawn wood. The wood for masame (straight grain across the playing surface) is quarter-sawn. I am no expert on aesthetics and tend to be a bit more utilitarian oriented, but I still like things that are nice. I use glass or yunzi or plastic stones, so I am not worried about slate or shell issues. I went with a slightly harder wood because I intend this to be a portable board and get thrown in bags and places with things that can potentially dent and scrape the wood. Soft woods would get torn up a bit faster. Maybe if I make another set beyond these two I will use something a bit softer, but finding decent stock can be an issue. Overall I am quite happy with the white maple and I liked the muted grain. I love this wood colour! And you worked it wonderfully! I own multiple go sets, one is bamboo which is very hard wood but which stay without scratches for life... But I like the light colour of your board more, the bamboo is a bit too dark. Smooth woods have their advantages for sure but in my way of life durability stay first as a must. 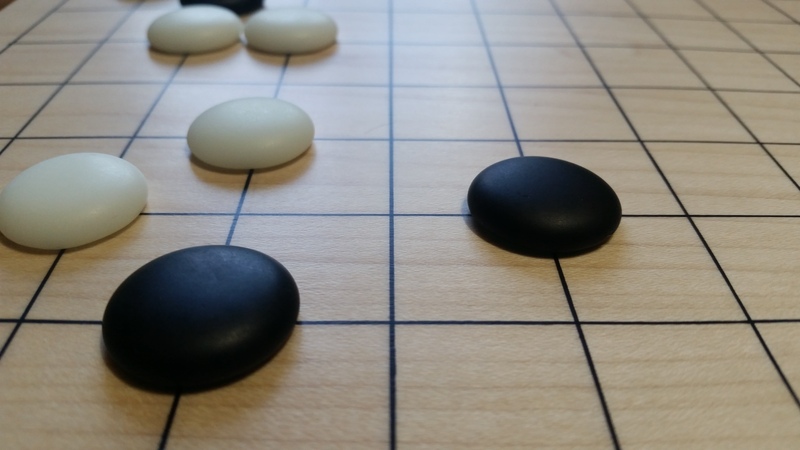 Most of the traditional go board woods are somewhat soft, e.g. katsura, kaya, hiba, hinoki, spruce, agathis. I suspect that somewhat soft wood is desirable because it cushions the fingers when the stones are "slapped" down. I've heard that clam shell stones can break if played energetically on a hard wood. Yes, the Asian boards were traditionally made from "soft woods". And maple is not only a "hard wood". It is a hard "hard wood". But just like there are rather hard "soft woods" (yellow pine, hemlock, etc.) there are relatively soft "hard woods". If making a go board from a local "hard wood" perhaps something like "poplar"? Lots of other possibilities. Would "tulip tree" be suitable? Those might be available is large size. If you plan to make another one, try to find a black pigment ink, like India ink, because the black ordinary ink of your pens might fade. Also, I am a bit surprised to see that white maple is hard. I've got a collection of mechanical puzzles in wood, and the ones in maple are the softest. Softer than oak, cherry, plum, or walnut. I don't have bamboo puzzles, but I've got go bowls in bamboo. Yes, it looks hard. But if you want a harder wood, try ipe ! Edit : of course ipe is too dark to make a go board. If you're looking for a tough, yet not too hard white wood, a good candidate would be hornbeam. But Maple is more beautiful. White maple is not a usual botanical description of a maple species. Most maple looks white when it has not been exposed to sunlight. Various species have different hardness. "Red" maple is softer than "rock" maple, for example. The meaning of hard or soft comes from whether the tree is deciduous or a conifer, not from how easily it is to dent the wood from pressure. Wood workers, such as carvers or turners think red maple is easier to carve or turn, while rock maple is a pain to carve. No one has mentioned that maple darkens on exposure to light, going from white to brownish. If a brown cast to the board is not unpleasant then your maple go board will be fine. Personally I find white maple to look raw but the color is pleasant after it is exposed to sunlight for a while. Many species of wood darken that way, e.g. maple, cherry, pine. The soft maple I've got is called sycamore maple. It is often waved. I think that it is the same that is used for music instruments. I have owned it for 6 years, with moderate exposure to daylight, without direct exposure to sunlight. It has barely darkened. It can only be seen because some parts of the wood are protected from ambient light and are a bit whiter. ...sycamore maple. It is often waved. Waved means warped, or to have wavy grain patterns ? It's caused by the weight of the tree itself as it grows, I believe. Is there some way to protect from the darkening? I guess applying some onguent maybe although I doubt it works as long as you need to play with light? And what about Sequoia? Seems to be easier to make a full thick with a nice cut. Is it too rare, or too dark? Is there some way to protect from the darkening? Avoid harsh, direct sunlight ? The "wave" in the grain is known as flame. I is found in many types of wood and is caused by growth conditions. Usually it is highly valued for furniture or musical instrument making. Personally I think it might be too distracting for a go board. Of course all of those issues of appearance are matters of taaste. I can say I was NEVER distracted by how the board is. For sure. So for me you can just focus on having a nice looking and comfortable board and not worry that much on lines, shapes or scratches disturbing your gameplay. Back on OP goban picture, I find it awesome. The yunze stones match so well the board material, gave me a "modern" feeling and is as good as a Asian esthetic more yellowish. My taste only of course. I really wanted to do this initially, but getting uniform lines was going to be extremely difficult. The fillable pens/markers I could find for pigmented ink make lines that are to thick and not uniform. I don't really want to use a sword or knife to do it, because a large jig would be needed and I'm not making more than a few for fun. Ultimately, if it does fade, it is about a half-day job to remove the old lines and finish and reapply the new lines and finish. The Staedtler Lumocolor Special marker I used should last quite a while. It is advertised as "Extremely lightfast (on smooth surfaces: black for 7 years; on paper considerably longer)." I would think it would last at least 10-20 years even if exposed to light since it is somewhat protected with the finish. It confirms what Gowan told us, and gives a measurement of the hardness of many woods. Hard maple (or rock maple) has a Janka hardness of 1,450 lbf, while soft maples have a hardness around 800 lbf only. That explains why my maple looks soft, while yours looks hard. Bamboo's hardness is similar as hard maple's, around 1500 lbf. But many tropical woods are harder than that. I talked about ipe. I was not mistaken, its hardness is 3500 lbf ! More than twice as hard as hard maple and bamboo. The hardest known wood is lignum vitae, with a hardness of 4390 lbf. I once had a small puzzle made of lignum vitae in hand. It was so heavy and hard that I could have mistaken it for a kind of stone !